Mangaluru, December 7, 2015: Two Mangaluru based photojournalists bagged state level awards in ’Anu National Photojournalists Convention-2015 held at Tumakur on Sunday December 6. Ravi Posavanike, Principal photographer of The Times of India, Mangaluru and Ramachandra Bhat of Mangalore Today received awards for their lifetime achievement in the field of news photography in a glittering function held as part of Photojournalists Convention. 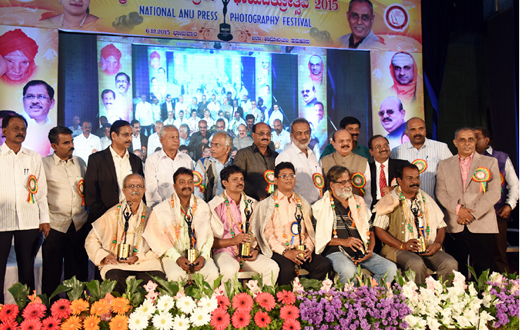 Astro Mohan, Senior news photojournalist of Udayavani, Udupi also received the award. Posavinike chosen for his ability to click best political photography while Ramachandra Bhat for crime scenes photography. 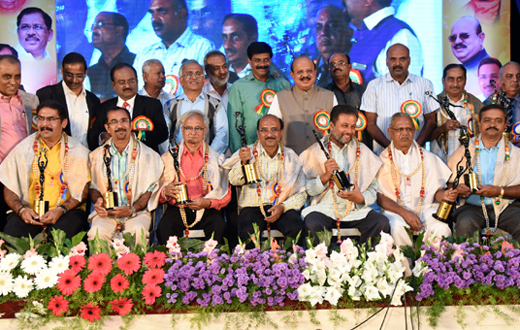 T B Jayachandra, Tumakur district in charge for Tumkur and Minister for Law, Parliamentary Affairs, Animal Husbandry and Muzrai, Karnataka honored all the awardees in the presence of guests.